Since 1968 Parisian Wigs has been serving its customers with the best prices on hair and services. Stop by to see our wide variety of wigs and weaving hair. Metro Discount: Mention "Metro," or "Crenshaw Project," or bring a printout of this page to receive 10% off any one of our products (includes wigs and weaving hair). New clients can receive 15% off every one of our products. 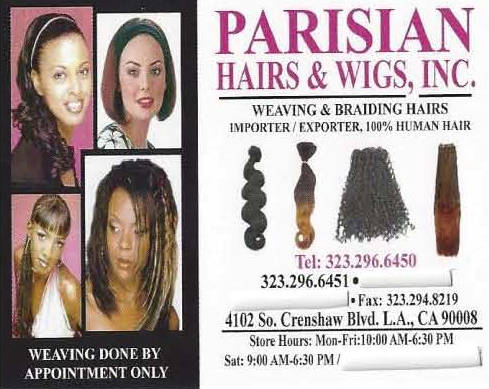 Go Metro: Parisian Wigs and Hair is located at 4102 S. Crenshaw Bl. Find your best route with the Trip Planner. More Info: For information call 323.296.6450 or 323.296.6451.